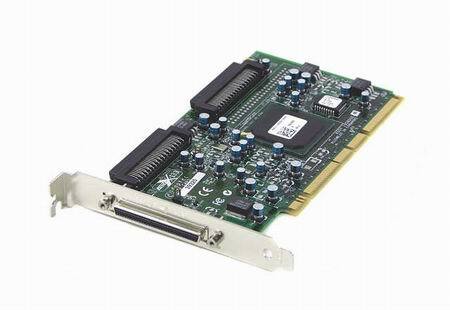 The Adaptec SCSI Card 39320-R is a 64-bit 133 MHz PCI-X, dual-channel Ultra320 SCSI card with integrated HostRAID™ RAID 0, 1 optimized for internal connections. The 39320-R is a cost effective hardware based RAID, a better alternative to software based RAID in the market today. It provides worry-free data protection at the fastest SCSI speeds available up to 640 MBps ideal for mainline storage, streaming video and audio, and other bandwidth-intensive applications. The card has a 68-pin HD external connector and two 68-pin HD internal connector for Ultra320 SCSI (LVD) hard disks drives. The 39320-R offers an unparalleled degree of investment protection and upgradability to Adaptec's entire SCSI RAID family of products. The controller is Brand New in Bulk Package, factory sealed, with Installation Guide. No cable or other accessories. Latest software or drivers can be downloaded from Adaptec site. New Amphenol Ultra320/U320 2 device, 68-pin micro-D cable with SCSI LVD Terminator. 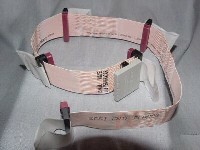 High Quality Amphenol Spectra Strip, Certified ULTRA 320 compliant. 30AWG, 34 twisted-pair for LVD SCSI. Ultra320 ultra160 Ultra3 Ultra2 Ultra Wide LVD SCSI cable. Compatible with any standard 68-pin internal drive or controller. Connect up to 2 SCSI devices. 3 standard 68-pin microD (HPDB68) male plugs and one LVD terminator. This brand new Ultra 320 cable by the famous cable manufacturer Amphenol has five connectors, connects up to four devices. This is the exact cable that is used with the Adaptec 29320, 29320R, 39320R and 39320A-R controllers. The Adaptec SCSI Card 39320A-R is a 64-bit 133 MHz PCI-X, dual-channel Ultra320 SCSI card with integrated HostRAID. The Adaptec 39320A-R is a cost-effective RAID 0, 1 and 10 solution. In addition, the Adaptec 39320A-R offers new drivers for HostRAID, both Linux and Windows Server 2003, as well as the same browser-based management tool used by Adaptec RAID products. The Adaptec 39320A-R provides data protection at the fastest SCSI speeds available up to 640 MByte/sec, ideal for mainline storage, streaming video and audio, and other bandwidth-intensive applications. Amphenol Ultra320/U320 4- device, 68-pin micro-D cable with SCSI LVD Terminator. 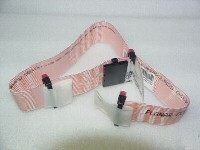 HIGH Quality Amphenol Spectra Strip, Certified ULTRA 320 compliant. 30AWG, 34 twisted-pair for LVD SCSI. 26" long with 10.5" from controller to first device, then 5.5" between each device connector. Ultra320, Ultra160, Ultra3, Ultra2, Ultra Wide LVD SCSI cable. Compatible with any standard 68-pin internal drive or controller. Connect up to 4 SCSI devices. 5 standard 68-pin microD (HPDB68) male plugs and one LVD terminator. This brand new Ultra 320 cable by the famous cable manufacturer Amphenol has five connectors, connects up to four devices. This is the exact cable that is used with the Adaptec 29320, 29320R, 39320R and 39320A-R controllers. The LSI Logic LSI21320 Ultra320 SCSI Dual Channel host adapter is ideal for high performance workstations needing high performance storage both internally and externally simultaneously without performance interruption. With 320 MBps and capability of up to 100,000 I/Os per second, this adapter is ideal for transferring high speed and high capacity data. Popular applications include video, data mining, Internet, email, graphics and other data intensive applications. The LSI21320 adapter features two independent Ultra320 SCSI channels allowing an aggregate SCSI speed of 640 MBps. It supports up to 30 external/internal devices for the greatest flexibility in a SCSI solution. With PCI-X throughput of up to 1056 MBps, this adapter also capitalizes on maximum system performance for those systems needing it; yet is backward compatible with existing PCI systems. It features LSI Logic SureLINK domain validation technology ensuring data integrity by intelligently testing the network before completing negotiation. It also utilizes Fusion-MPT architecture that allows for thinner drivers for better performance (up to 100,000 I/Os per sec) while adding value and flexibility at the firmware level.